You may think that fences made out of vinyl or steel are trendy due to low-maintenance. Metal is easy to clean and doesn’t rust easily. However, wood is still one of the top picks. Why? Wood has a classic, all-American aesthetic to it. You may think that fences made out of vinyl or steel are trendy due to low-maintenance. Metal is easy to clean and doesn’t rust easily. However, wood is still one of the top picks. Why? Wood has a classic, all-American aesthetic to it. When you walk or ride past a yard with a picket fence, you may find yourself at peace. 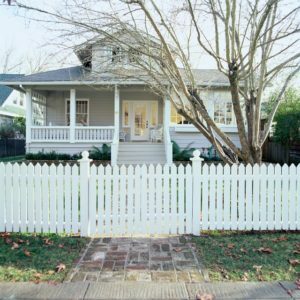 Traditionally, people associate picket fences with the ideal lifestyle. They represent the American dream. Though wooden fences are iconic staples, they aren’t expensive whatsoever. Believe it or not, there are maintenance-free wooden fences. While scratches and the need to clean is inevitable, some choices provide less hassle than others. Most people want to invest in a quality product that will stand the test of time. Are you one of these people? Then keep reading to learn about maintenance-free wooden fences. When you select a grade of wood for your fence, make sure to pick from construction, select, premium, or clear grade. These grades have the highest quality and aren’t prone to insects or rotting. While these choices are the most expensive, it could save you money in the long run. Always needing to repair or spruce up a fence can add up over time. These woods are among the most affordable. Spruce is often used to create prefabricated picket fences while pine and fir are pressure-treated and coated in chrome copper arsenate which prevents insects from living inside the wood. Pine and fir also aren’t easy to stain because of water resistance. Here are two other kinds of wood that combat insects as well. Cedar contains cypretine which gives off an aroma that repels insects and makes it rot-resistant as well. If you don’t live far away from Southern state, cedar is a better choice for your budget because cypress can be expensive to ship. Redwood is the most expensive. Using redwood for a smaller fence is practical. Nonetheless, this wood is durable. An alternative to saving money could be to use redwood on the panels only while you customize your posts with a lower-grade. Not only is redwood the most resistant to insects and rot but its clear coating prevents discoloration. This entry was posted on Thursday, March 21st, 2019 at 2:52 pm. Both comments and pings are currently closed.